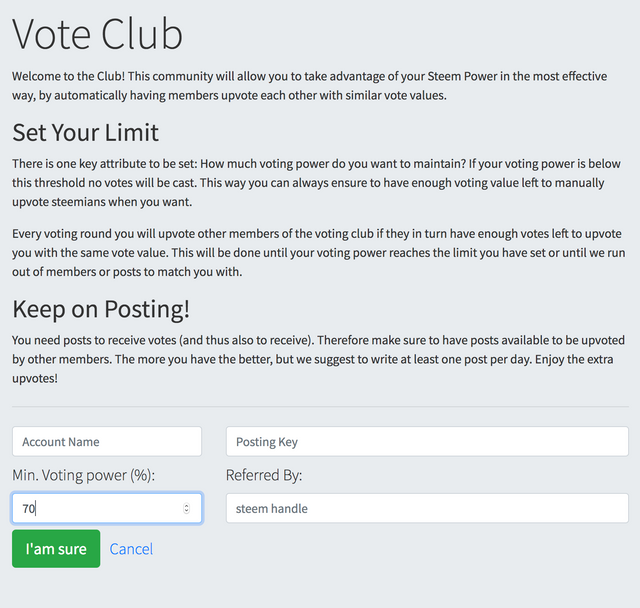 We call it Steem Vote Exchange Club and the idea behind it is simple: exchange votes like for like. Any member that joins the club will upvote other members if they can return the favor with a similar vote size. In other words the service matches user and automates the exchange of votes of similar value. Get highest possible return for your Steem Power, better than delegating to voting bots. Do good for the Steem ecosystem, as you are still upvoting content. Ensure more visibility of your posts – they are upvoted more. We like to build services we want to use ourselves and that we think are good for the ecosystem and the community. Here are some of the reason why we think this is a good idea. Deal making: There are many users that have deals with each other on steem. Essentially the Voting Club is like doing a deal, but you do not have to trust that the other side will hold true to their word and you won’t need to connect and actually negotiate with them. So we see this service as automating something that happens a lot anyway and allow everyone do it it efficiently, weather you have little or much SP. Efficient Use of SP without Delegation: Some of us want to be active on steem and use SP to reward users whenever we want to vs auto upvotes or via manual deals. As result you may not want to delegate your vote to a bid bot or use it in auto votes. We allow you to use automatic voting in a way that is profitable to you, but only until a certain percentage of your voting power is used, which you specify. This way you can always vote the way you want with all of your Steem Power, but if you have extra voting power it can be used to your financial benefit. SteemPower should power your posts: We think content is the most important thing on Steem and we want you to be able to use your Steem Power to push your own post. The voting club is the best way to attract votes from others with your SP. Support content: You still have to write post if you want to get upvotes and make money. This we think is important for the health of Steem. We believe that your SP should push you if you write content. As such we also try to keep the dream of great content on Steem alive. We have made the signup easy as pie. All you need to do is provide your posting key and select how much of your voting power the service is allowed to use. We want you to know exactly what is going on so we have created an overview of your activity. Of course you can also pause the service, make changes or even delete your information. If your into the details you can check your activity log, which will show any incoming and outgoing votes. After every 10 full votes (i.e. if the votes you receive add up to ten 100% votes for you) we will take your posting key and give one vote to steem-bounty. We are also working on a VIP system, which will then reduce that vote. A few users that have helped us test and signed up early will also be VIPs and essentially have the service free for 3 months. If you have a lot of SP and think this is unreasonable, get in touch with us and we will consider making you a VIP also. We suggest to go check out the landing page we built for the service. Thank you very much for your attention and we hope you will vote for us as witness! And enter the "steem-bounty" account into the text field and click vote. Or use steem-connect to vote directly for us as Steem witness! You need posts to receive votes (and thus also to receive). Therefore make sure to have posts available to be upvoted by other members. The more you have the better, but we suggest to write at least one post per day. Enjoy the extra upvotes! I think that promotes communication here on steem and I like to support it. Awesome, we thought so too. Except it doesn't. Real communication is in engagement. So this is neutral as far as I'm concerned. This is such an amazing idea, and well done. I can't wait to see how many people will start using it. Thx for your ongoing support! @steem-bounty , I signed up two days ago and see that my Vote Club activity log shows an exchange yesterday, but not today. I posted at 7 am this morning. Is this normal or are there issues? Also, my vote power is only .002 at 100%. 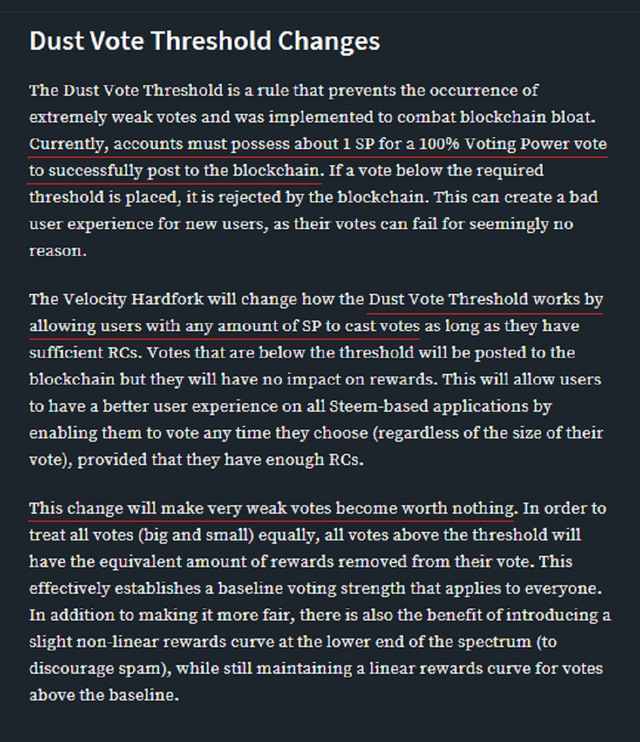 Will the HF20 Dust Vote Threshold Changes reduce my vote power to ZERO, thus making it pointless to participate in this vote exchange program? no worries, we are currently upgrading our service it will be back up in a few hours. There were a few things that came up with all the new sign ups. You should be fine even with a few cent vote. We have tested this with users that have less. Thanks for signing up and the patience. @knircky Thanks for the update. My vote-power is .002 - less than a few cents. I'll check the post-HF20 impact on my votes to see if there is any point remaining in the Steem-Bounty Vote Club. Thanks again. Your vote will still have value at 100% even after the HF. It's the small 3sp accounts or those voting with 0.4% when they only have 100sp that will be wiped away. You need to case a vote worth more then 50 vests which I believe sits under 2sp right now so you have plenty of power to have votes that register on the blockchain. What happens if I don't have a post to be voted on? Will the system detect this and not cast my vote without receiving the vote back? If I only make 1 post per week, will this post be voted on the whole week until the 12 hour blackout period? If I have 3 posts that can be voted on, will it only vote the newest? correct, if you don’t have any post, nothing will happen. it will match as many votes as possible. There must be another member and you must have voting power available. So every possible post is taken into account. So in case of number 3. every post will be voted on as long as I have VP over my set limit, right? Yes. That makes sense right? I am curious how this will work out. I hope it will free some SP out of the bots delegations. Is there a refferal system? Just asking because of the reffered by. Go to steem-bounty.com. There is a new section that shows you all the latest bounties. We also have a category for biggest bounties and the ones that expire. What do u think abou the steem-bounty.com website, is that what you are looking for? Mate i m on my mobile now. I ll check that on my laptop and reply u asap. Sorry for being late. it works fine on the mobile as well. Keep in mind that just like other posts you want to leave trying engaging comments. Take a real interest in what they are post and then comment. This is the way to getting part of the bounty. Keep plugging away @mango-juice and you will get there. Vote for vote? Really? Support what is good. We don't want to turn Steemit into a crap-fest. Is it any better now?Can you say all those people who make a lot of money here write great content.I think not even 10% of them write something good.I have seen a lot of stupid posts making a lot of money. To be fair...folks involved with @steemflagrewards and @steemcleaners probably consume content way more than the average Steemian. We actually have to go through the content before we decide to flag them. It doesn't hurt to check out the OP when flagging a comment spammer. Comment spammers are just another way for me to discover creators. It's a lot of work, but I've seen it have good results. We can steer some newbies to a better path. I don't think it will get any better. I agree. That is annoying. I have seen that so much. All Automatics can vote only good content... and thats why i decided to stop sell my Power and get into Trails of commuinities which do a preselection of Users or doin manual Curation!! Thats the way.. This will just lower the quality of Steemit as people pump out junk posts just to get a vote. Support what is good, don't vote for those who buy votes unless you actually like what they are doing. You can make more from good comments than crap posts. I agree with the guy. Steemit is already full of bots and there is no fair competition going on in this platform.I have worked hard but I see no result.It is better to exchange votes than wasting many hours for writing good content. Dude, you haven't even been here six months. What communities are you involved with? Where do you put yourself out besides blogging on Steemit? Just like any other social media environment, it takes a large amount of effort and time to get yourself into a position where you're rewarded consistently, let alone to the level you want. I've found good communities that I will keep working with. Too many come looking for a quick buck and are disappointed. Let's see what happens after the hardfork next week. I think it's about forming real communities around an interest and not just scrabbling for cents. Make it as fun as whatever other social sites you use plus there's potential to earn something. We can try to nudge them onto the right path. Some start of with spammy comments, but I'll suggest they try actually interacting. Some get it. If they keep doing it they may get flagged. Amen ! At least Steemfollower use the same system but you have to manually pick the articles you want to vote for ! I thought the I vote you if you vote me idea was frowned upon here. Is it not now? It’s only frowned upon when the frowner is not the one making money off of it. If you can turn vote-4-vote into a profitable “business,” then it’s OK.
See? Doesn’t that make it better? Yay! We’re all gonna be rich again!!! Interesting. I will watch to see how it goes. It's nice to see at least a new approach. I have no issues with people using this, but a vote trade doesn't really impact quality. However, I think it is great for distribution as at least smaller users can link up with other smaller users. Yes this is true. However we twnd to do well here on steem if these services support quality content. So my hope is that this will help content as content. Automated circle jerking won't impact quality? Are you sure? Why do you think that; is it because it hasn't in the past? Or because you think it is a good idea to let vote size depend on the size of the other's persons wallet or vote? This is yet another nail in Steemit's coffin. I m sure that I m definitely inn..
That is really a great project with amazing minds. It's a great favour for growing on steemit. Thank you! Will you be signing up? Is there a way to end your account if you sign up and decide you no longer want to be a member? Alright I'm going to review your project at my spare time. You got a 62.50% upvote from @upmewhale courtesy of @steem-bounty! Awesome signed up and placed a couple of bounties. Your service was always a nice way to find new content while still being in control of what seemed upvote worthy to me. The added reward was a sweetener. Looking forward to check out this new feature. You got a 86.96% upvote from @postpromoter courtesy of @steem-bounty! This looks like autovoting with a few extra steps. Great idea for the steem network and there users. Thank you! You got a 69.19% upvote from @upme thanks to @steem-bounty! Send at least 3 SBD or 3 STEEM to get upvote for next round. Delegate STEEM POWER and start earning 100% from your share, daily payouts ( no commission ). So steem-bounty gets one FULL upvote each day? I like the idea, but I do think that is kind of excessive. hola ... son muy buenas ideas y se ve muy prometedor !! Sinceramente necesito que se me explique mejor, no logro comprender esto. Que clave debo utilizar? Apenas estoy iniciando en steemit y no sé si mi poder de voto sea suficiente, quien me ayuda a comprender mejor esto y me dice si me beneficiara a mi que apenas estoy iniciando? I have a question is the service is violating the guidelines of steemit? I like this idea and paused other services to be sure that my votes go through steem-vote-exchange-club! One small question: what is the timing of the voting rounds? But is it safe to use?and how much steem power I need to join? Hate it, for the same reason I generally hate bid bots and voting. I will say that this is a clever service in the midst of all that. My intuition tells me it can take a good chunk out of @smartmarket and @minnowbooster . There's one component missing to fully unseat them, and that is the ability to auto post or reciprocate in comments (because many participants in these are entirely passive). Yuck. Not sure why you would lump this service together with steem bounty either. It's going to have mixed reactions. What if there is a real blacklist to block spammers/plagiarizers from using the service? Would you rather a service that lets real content providers give each other a little bump each post instead of selling votes off on smartmarket and minnowbooster? I am kind of the mindset that it's better this way. I have suggested a blacklist on the steem-bounty telegram account already and was told if it takes off this is something that will be done. That gives me hope that maybe this can be a service to help those with limited resources to find a way to make a little more on their posts and investments into steem (time and money). Have seen a few great people leave steemit because they couldn't figure out how to make enough money per post to justify the efforts they were making and they liquidated their SP or turned it over to the bots. This doesn't help steemit in the least when this happens. There needs to be some other options and I like that @steem-bounty is trying to come up with options. I would assume a whitelist works better than a blacklist for that purpose. Actually yeah I was thinking about adding a further comment about allowing communities to set up systems with this, but I held off. Not sure if it really fit or not. But out of principle I can't accept a service that is idle and not giving a meaningful measure of engagement (note, engagement, not content. of course content itself is not enough). IF there's not enough money to go around, then that's a limitation of the system. Don't look for more ways to milk the system. That's like looking at a leaky tank and poking more holes in it so you can siphon more for one's self. First off thanks for your feedback. We have a blacklist in place already for steem-bount, so this is laready thought off. I doubt that it is even required because for this service to be effective one needs to hold SP which spammers and cheaters never do, but we are ready for them. Remeber u cannot buy votes with our service at all. will try to give this a shot, signed up! Really interesting, at least a better solution than current bidbots, more organic. Finally someone made this service. Would be interesting to see how it works. I've signed up but when I started to create a post , I can't enter the image at the site. is there a bug? Site. is there a bug? Hope this thing will give a great benefit for those who active in this platform! I have just signed up, I am looking forward to see how it goes. I am also making use of steemvoter, what will happen if my steemvoter account votes for a person, that is part of the vote club? If u have already upvoted soneone, we cannot use that post for a vote exchange. Thank you for the feedback. I am quite impressed with the service so far, it is not yet 24 hours, and I received 5 upvotes, and I am still above my minimum votepower threshold. I think this initiative will be very successful!! wish i have those hands & keep upvoting such as this creative funny post!! Operation Failed. Please check your account/posting_key combination. I feel certain that I entered the correct information.